This is a sponsored post written by me on behalf of American Family Insurance for IZEA. All opinions are 100% mine. Making your dreams come true is not granted by a genie or the wave of a magic wand, even though I secretly wish it was so every day. It takes a lot of hard work, dedication, and careful planning. 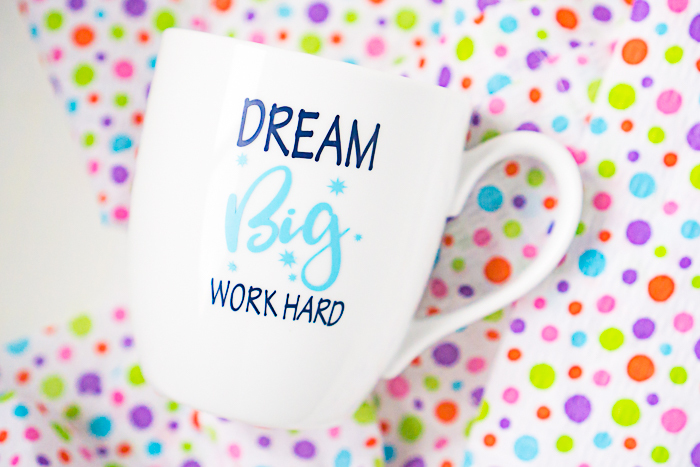 I’m sharing a few quick tips I’ve picked up on keeping my own dreams alive and doing what I can to protect them with the help of American Family Insurance, and a quick vinyl craft project that makes the perfect reminder of those dreams or a great homemade gift idea for the holidays! Almost five years ago, I made a complete change in my career. Teaching high school English was causing me immense pain through severe migraines, and my school was going through a rift and letting newer teachers go. We decided then and there to make The Love Nerds my career. For my health and for our future children so I could work from home with them. Learning how to keep my dreams alive hasn’t been easy over the years, but there are a few things that help me stay motivated and work hard. Because as cliche as it might sounds, anything worth having requires hard work and dedication. It’s easy to chase a dream and to lose steam in the process, slowly watching it escape you. It’s harder to plan for it, to manage it every single day, to help it grow into something successful, and to keep going when it doesn’t go your way. The Love Nerds is not what I want it to be right now. It’s not what it even was in many ways two years ago before my mom passed away because honestly, the hardest thing about keeping your dreams live is doing so when life gets in the way. If it’s your dream and your business, you don’t have the luxury of always stepping away and having someone else pick up the slack. My time away to grieve and my time away to have Liam may have impacted my dreams and even diminished their success for awhile, but it’s a dream still worth pursuing. I’ve talked a lot on the blog about goal setting over the years because as a type A achiever, I like to know what needs to get done and get a high from seeing it scratched off my to-do list. As a work at home mom, my biggest struggle has been monitoring my self-esteem with a new goal setting bench. I simply can’t do the same amount of work that I used to be able to do. So be reasonable with yourself. Decide what absolutely has to be done and what would be nice to achieve, and write them down! Writing down goals tells your brain that it’s important and helps you remember. I also strongly believe that repetition of goals helps you believe them. If I write down enough time, “I will become a successful family photographer”, I actually start to believe it can happen while reminding myself what I’m working hard for. Are the goals you are setting helping you achieve your goals? We hear it all the time – “Time is Money!” Time is also a rare commodity in most of our lives, so you need to make sure that the things you are spending time on are helping you achieve your goals. If yes, make sure it stays in your routine every day or every week no matter what. If not, make a new plan and try something different. For me, I think this is when The Love Nerds started to struggle in 2016, and when I say struggle, I mean no longer met my personal goals for the business. I am reminded constantly by friends and family that taking a step away from the business made sense. That it was the best thing for my personally. I agree. But when you are pursuing your dreams, what is best for your personally is not always what’s best for keeping your dreams alive. I wish that I had forced myself to put the minimal effort on the blog every single day because it would have kept my efforts toward my goals, even if I wasn’t reaching their full potential. It would have also kept the routine of tending to my dreams. Like a shark who dies if it stops swimming, our dreams can die if we stop putting the work in. We have to keep moving! As a work at home mom this past year, I’ve learned through lots of trial and error that there are days where everything goes wrong and the business won’t be a priority, even if I want it to be. On those days, I will force myself to do the minimal amount of work. If I only have 15 minutes before my eyes refuse to stay open at the end of the day, I have identified a few small daily tasks that only take 15 minutes. If I have 30 minutes before dinner when my husband takes my kid to play outside, I spend those 30 minutes writing one section of a post instead of the whole post I wanted to have done. Always keep moving! This one is two fold. First, shut out the negative noise around you and protect your dreams from naysayers. I don’t care what my family thinks about my job. I don’t care that we have friends who still don’t understand 5 years later how I could possibly be making money. It’s my dream and it’s worth growing. But also, whether it’s working for yourself, starting a new career, or going back to school, it will generally involve some risk. I only feel confident taking risks if I know that I, my family, my home and my dream is as protected as possible. This is where American Family Insurance comes in. American Family Insurance DreamKeep Rewards is an interactive experience that rewards you for the smart things you do to protect the people and things that matter most to you and your dreams. They provide short, informational articles under a variety of topics: home safety, on the road, family, personal success, and important life decisions, followed by a quick 3-4 question quiz or questionnaire. They take very little time to complete but give helpful information or ideas to consider. Plus, you earn points for DreamKeep Rewards, such as family passes for fun local activities, restaurant.com gift cards, beauty treatments, concert tickets and more. I will be sharing more with you later about this program, the earning of points and the prizes, but until then, you should sign up now so you can start earning prizes right away! Knowing that the things that matter most in my life are protected helps me focus on my dreams! Do you feel protected? Make sure to sign up for the DreamKeep Rewards, which is free! It’s an easy way to learn about keeping your family, home and dreams safe. Positivity goes a long way in keeping your dreams alive because we tend to be surrounded by a lot of negativity or just a lot of unimportant noise. 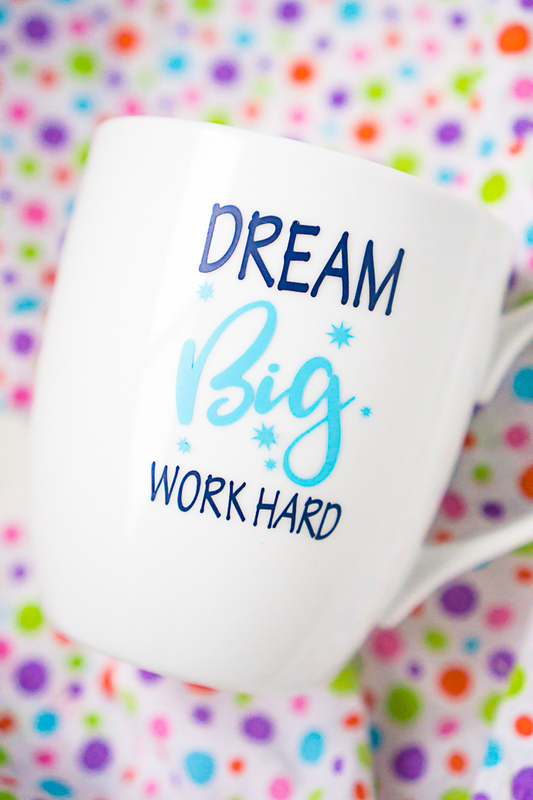 Finding something positive to focus on, even if it’s a motivational mug with your morning coffee like the one I’m sharing with you below, can really help you focus on what matters. Surround yourself with people who will push you, support you, and assist you. Surround yourself with intelligent people who have advice to motivate your dreams – book, podcasts, etc. Surround yourself with your own success so you can see what you have already accomplished from your hard work. Surround yourself with helpful tips and guides, likes the DreamKeep Program! Surround yourself with visual motivation. Motivational posters got a bad rap in the 90s, but I’m all about the motivational mug, planner,and even pencil. After setting the design for your desired size and cutting, decide if you want one color or multiple color. I chose to remove the “big” from the design and cut out the top and bottom in one color first, and then cut the “big” out in a lighter blue. After cutting the design, remove the unwanted vinyl on the outside of the design and use a hook to weed out any unwanted vinyl inside the letters. Do this process slowly and carefully, especially with smaller cut designs. Prep the mug by cleaning the outside with rubbing alcohol. 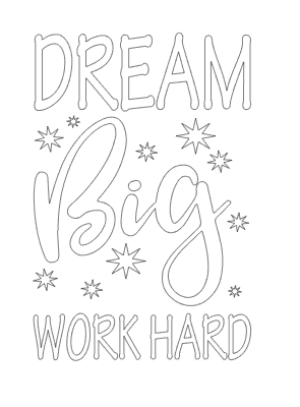 Use transfer paper large enough for the entire design to “pick up” the “big” portion of the design first, carefully placing it into the correct spot on the “dream/work hard” design. Then, use the transfer paper to pick up the entire design and move it onto the mug and gently place in the desired location. I like to start in the middle and slowly stretch, pull and rub the design into place. When you are working on a round surface, especially one that might be bigger on the top then the bottom, you will want to work patiently. Use dead space where there is no vinyl to scrunch or fold extra transfer paper so you can pull the design part smooth. Once the entire design is in place, rub thoroughly and then slowly remove the transfer paper. You might need to help keep a portion of the vinyl down, so work slowly!